Whether you’re responsible for finding and keeping amazing employees or determining who should receive that sought-after scholarship, Parchment has a service for you. From verifying to collecting to awarding, we’re here to make sure the transcripts you receive are secure and the digital certificates you issue are instantaneous. Say goodbye to credential fraud for good. Our user-friendly platform simplifies the jump from paper to digital. Partner with the trusted company that has processed over 40 million records since 2003. You can start receiving secure, verified transcripts in one unified inbox, to help your organization determine the best applicants in the pool. No more worrying about credential fraud. 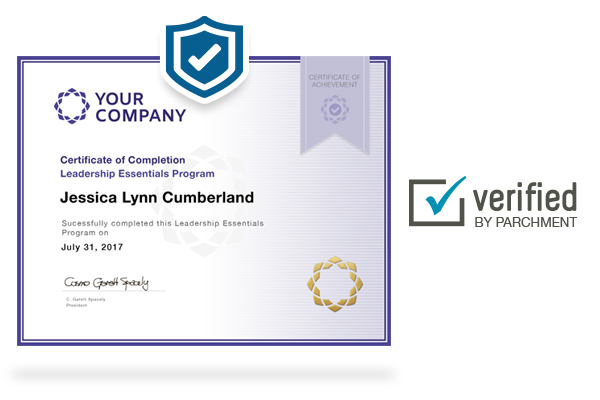 Award your employee achievements with digital certificates and badges. Customize expiration dates or even revoke them when necessary. And it’s a win-win. Your employees can easily share them on social media with pride, which expands your brand reach and attracts more talent.